Nightmares and Daydreams is a short collection of mystery, horror/thriller, and paranormal short stories and poems (5 stories & 4 poems in all). I first picked up this book when my husband was out of town for a couple weeks – after reading the first page I opted to put it down until he got returned. Haunted houses, mysterious towns of blood-sucking villains, mystical jesters that bring protection and death, murderous spouses, and money hungry showgirls, there’s a little something for everyone. Hosting a sleepover with hard-to-scare teenagers? Watkins has just what the doctor ordered. Although I wouldn’t recommend this pick if you’re prone to nightmares. My only complaint a bit of repitition. I noticed two females characters in two of the stories were described the exact same way. Barring this issue of personal taste, Nightmares and Daydreams is the perfect quick read for your beloved short story and horrror lovers. “Writing in the genre of Paranormal/Thrillers, she [Watkins] loves to evoke a sense of terror and hopes to continue to entertain her readers for some time to come” I was certainly terrified, entertained, shocked, and appalled – when appropriate. 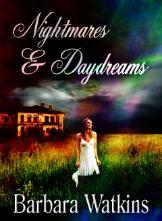 You can visit Barbara Watkins online or buy Nightmares and Daydreams on Amzaon.